The Finnlo Bio Force Multigym is innovatively designed to use a combination of pneumatic pistons and simple physics to make a more lightweight yet smooth multigym (also known as Total Nitrocel Technology - or TNT System). 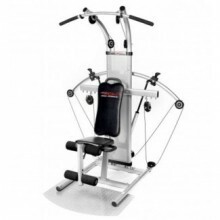 The Finnlo Bio Force Multi Gym is smooth, solid and with a max load of 100kg per arm, you're sure to be tested, whatever your level of ability. Here's the physics: When the pneumatic pistons on each arm are upright, you are applying a lot of force downwards on a small surface area which makes the resistance less. As you move the ram to higher resistance, the angle changes which means the same pressure over a larger surface area. This makes it harder to push the hydraulic ram, hence the heavier resistance. A good analogy is to think of pushing a pin into a normal, plastered wall - pretty easy. Then try to push a thick, blunt nail into the wall - very hard. The pin tip has a very small surface area, which makes it easy to push in. The nail tip has a comparatively large surface area, so it's a lot harder when you apply the same force (you pushing). Adjustment for: Elbow joints, leg flexion device and seat (2x adjustable) adapt ideal all body sizes. Seat is removable. Transport: Integral Transportation Rollers - A clear advantage over other Multi-gyms. Click the button below to add the Finnlo Bio Force Multi Gym to your wish list.